If you have lost a loved one due to wrongful death in North Miami, you should know that you may be entitled to damages compensation. Depending on various circumstances of your case, you may be entitled to financial compensation for funeral costs, loss of financial support, medical costs from the time of the accident until death, loss of parental guidance and training, and other potential items of damage. But it isn’t easy and that is why you should speak with the best Miami wrongful death attorney that you can call. Since the responsible person doesn’t want to pay you yet, it’s clear that you’ll need to put some work to get recovered financially from the horrible event. You’ll have to prove that the decedent had been involved in an accident for which the person is liable and died due to that accident. If you don’t know how to prove it, call 305-285-1115 for your free consultation with our North Miami wrongful death lawyers at the Wolfson Law Firm. Let’s determine if you qualify, how much your case is worth, and how you may be compensated. We don’t ask for fees unless we recover for our clients. 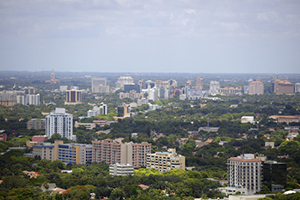 North Miami is the sixth-largest city in Miami Dade County with almost 60,000 residents. It is located 10 miles north of Miami. It borders with Golden Glades and North Miami Beach on north, Pinewood and Biscayne Park on south, Opa-Locka and Westwood on its west, and Biscayne Bay, Sunny Isles Beach, and Bay Harbor Island on its eastern border. North Miami is the home of the Biscayne Bay campus of the Florida International University, as well as the Oleta River State Park, the largest urban park in Florida. Our Miami wrongful death lawyers and personal injury attorneys have more than five decades of experience helping victims and their families. We have bilingual Miami wrongful death lawyers who are ready to help you and your loved ones no matter what type of unfortunate accident befalls you and your family. You are one phone call away from learning about compensation you may be entitled to for your immense loss and what your legal options are going forward in your journey to justice. Call our North Miami wrongful death attorneys at the Wolfson Law Firm for free consultations at 305-285-1115. We handle cases on a contingency basis. For you, it means that we won’t ask for any fees during the process, but only when we recover damages for you. There is no risk in calling us to get the information you need.